The Microsoft Surface Pro is a brilliant tablet that also turns into a powerful laptop-like device. The hinge bends back even further than it did before – into a new “Studio mode” that makes for a narrower, 165-degree angle from which you can edit your photos with more freedom. Basic photo-editing through Lightroom or Photoshop is a breeze on the Surface Pro, while video-editing video in Adobe Premiere works well in HD. Meanwhile, battery life is much improved from the last model. If you are work with huge batches, lots of data or huge Photoshop composites, this isn't a replacement for your main machine – but for most jobs the Surface Pro is more than capable. And once you take it with you on the move, this is a stunning, powerful machine that will ramp up your productivity. 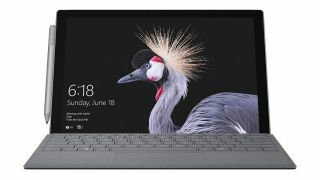 Save 34% - You can save over a third on this versatile Microsoft Surface Pro 12.3-inch laptop-tablet. It boasts an Intel i5-7300U processor, 8GB RAM, 128 GB SSD, runs Windows 10 and is super comfortable running Lightroom and Photoshop. This is a huge discount on a brilliant machine – don't miss it. Save £379.01 on a Microsoft Surface Pro laptop.